Grandpa Bredo is over 110 years old. For years, he’s taken up residence in a Tuff Shed in the hills above Nederland, Colorado, where he remains very, very, very cold. More specifically, Grandpa is frozen in a state of suspended animation, awaiting the big thaw. The one that will bring him back to life. There is a good story behind this, one that stretches from Norway to California to Colorado, involving cryonics, deportation, psychics, celebrations, and a dedicated Ice Man. It’s a tale that has captured international attention and sparked a must-attend annual event called Frozen Dead Guy Days. So how did all of this begin… and more importantly (particularly for Grandpa Bredo), how long will it last? Before Grandpa Bredo Morstoel died from a heart condition in 1989, he enjoyed a comfortable life in Norway, where he was born and raised. He loved painting, fishing, skiing, and hiking in the mountains of his homeland. He was also the director of parks and recreation in Norway’s Baerum County for more than 30 years. After he died, things got really interesting. Instead of a burial, he was packed in dry ice and prepared for international travel. First, he was shipped to the Trans Time cryonics facility in Oakland, California, where he was placed in liquid nitrogen for almost four years. Then, he was moved to Colorado in 1993 to stay with his daughter Aud Morstoel and his grandson Trygve Bauge, both strong advocates for cryonics who hoped to start a facility of their own. There he stayed for years under cold cover, in a shed, near his grandson’s home, and about to be left on his own due to some pesky visa issues. If you peruse the laws of Nederland, you’ll discover that it’s illegal to store a frozen human or animal (or any body part thereof) in your home. We have Grandpa Bredo to thank for this. When grandson Trygve was deported in the mid-90s because of an expired visa, Bredo’s daughter stepped in to take care of the household – including keeping her father on ice. Luckily for Bredo, he was grandfathered in and allowed to stay. Suddenly, he was a worldwide media sensation. And he has been well cared for by his family and community ever since. Bo Shaffer saw an intriguing want ad on the Internet in 1995 posted by Trygve. He applied for the one-of-a-kind job, got it, and is now known as the “Ice Man.” Every month, Shaffer and a team of volunteers delivers 1,600 pounds of dry ice and packs it around Grandpa Bredo in his sarcophagus, surrounded by foam padding, a tarp, and blankets. As Cryonicist-in-Charge, Shaffer keeps Grandpa at a steady -60 degrees Fahrenheit. He also gives tours to investigators, filmmakers, local volunteers, and even psychics who have purported to communicate with the dearly departed (by one account, Bredo is amused by the fuss but doing fine). Shaffer feels the weight of this responsibility, knowing how much has been invested in keeping Grandpa in his cryonic state. 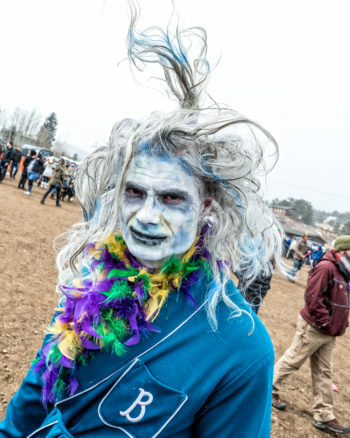 Now frozen for over 20 years, he has kept the hope alive for his family and their faith in cryonics, as well as spurring an annual festival in Nederland that has grown into a full-fledged winter celebration. The community experiences a new burst of life with the festival’s creative contests, icy events (including coffin racing, polar plunging, frozen salmon tossing) basically if it is fun and can be done in the cold, it goes! People come from around the world every March to experience the legacy of Grandpa Bredo – even representatives of cryonics organizations who want share the science behind this unique story.